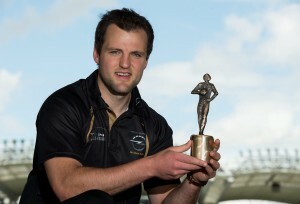 Michael Murphy is the Opel GAA/GPA Gaelic footballer of the month for May. Donegal captain Michael Murphy has been named footballer of the month for May following his superb performance in the championship quarter final victory over Derry. The full forward scored two sublime points that day, one from the sideline that he really had no right to even take on and the other after a superb drop of the shoulder which left two Derry players dumbfounded before firing over in the blink of an eye. Murphy also played a vital role in the Leo McLoone goal, fetching a ball from the sky before popping it off perfectly for Frank McGlynn on the run. The big full forward’s imprint was all over this victory and Jim McGuinness will be hoping that this is a sign of things to come for the rest of the summer.